Alcohol is the most common substance used by Canadians, and many have communicated the benefits, and social and cultural significance of consuming alcohol. While many people drink without a negative effect, alcohol was shown to be the leading substance causing the most harm in Canada, after tobacco use, contributing to significant economic, health, social, and criminal justice costs. In 2014, the total cost of alcohol use across Canada was determined to be $14.6 billion. The Canadian Centre on Substance Use and Addition has identified a number of harms associated with the over-consumption of alcohol, including chronic health conditions (i.e., cirrhosis of the liver), motor vehicle accidents, suicide, violence, mental illness, and fetal alcohol spectrum disorder (FASD). Harm from alcohol use has also shown to be of particular concern in Aboriginal communities, as well as among youth, seniors and pregnant women. For instance, the 2015 prevalence of past-year use of alcohol among Canadian youth in the 15 to 24 year old group is at 83%, which is slightly higher than the adults aged 25 years and older (78%). In response to harms associated with over-consumption, the Canadian federal, provincial and territorial health ministers launched Canada’s Low-Risk Alcohol Drinking Guidelines (LRDG), consisting of guidelines and of tips to help Canadians moderate their consumption and reduce their risks of alcohol-related harm. Experts agree that approaches aimed at reducing the harms associated with alcohol use must be multifaceted – involving key players from the enforcement and justice sectors, an increase of public education, and targeted interventions in settings such as schools, workplaces, and alcohol-drinking establishments. 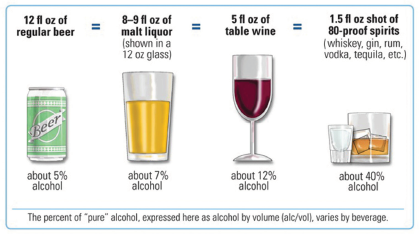 View Canada’s Low-Risk Alcohol Drinking Guidelines here.